Abuja — The National Judicial Council (NJC) has given the Chief Justice of Nigeria (CJN), Justice Walter Onnoghen, another seven days to respond to a fresh petition against him, by the Economic and Financial Crimes Commission (EFCC). The council, which took the decision yesterday at its emergency meeting in Abuja, also resolved to constitute a complaint panel to look into the various complaints against both Onnoghen and the Acting CJN Justice Tanko Muhammad. In another development, the UN Special Rapporteur on the Independence of Judges and Lawyers, Diego Garcia-Sayán, has warned of an imminent threat to the nation's judiciary, owing to moves by President Muhammadu Buhari-led executive arm of government to remove the Onnoghen from office through illegal means. The NJC had at its sitting on January 29 adjourned to February 11 after it gave both Onnoghen and Muhammad seven days to respond to the allegations against them. However, a statement from the NJC's Director of Information, Soji Oye, disclosed that the body at its emergency meeting yesterday received a fresh petition from the EFCC against Onnoghen, and he was directed to reply to it within the next seven days. "The National Judicial Council reconvened today in an emergency meeting to consider the responses of Justices Walter Onnoghen, and Tanko Muhammad, to the three petitions written against them. "Members resolved to constitute into the Preliminary Complaints Assessment Committee in accordance with Regulation 17 of the National Judicial Council Judicial Discipline Regulations, 2017 and report to council on February 13, 2019. The Council will reconvene on Wednesday, February 13, 2019. "Council also received a new petition written by the EFCC against Justice Onnoghen, and forwarded it to him for his response within seven working days", the statement read. It added that the NJC reaffirmed its confidence in Justice Umaru Abdullahi, as Interim Chairman of the NJC. Justice Abdullahi was at its first emergency meeting on January 29, elected to chair the meeting, following the absence of Onnoghen and Muhammad at the meeting. Onnoghen and Muhammad had recused themselves from the meeting as a result of the petition against them. While one petition by Zikhrillahi Ibrahim of Resource Centre for Human Rights & Civil Education was tabled against Onnoghen at the NJC, Muhammad had two against him by Centre for Justice and Peace Initiative and Olisa Agbakoba (SAN). However, another petition against Danladi Umar, Chairman, the Code of Conduct Tribunal by Centre for Justice and Peace Initiative was referred to the Federal Judicial Service Commission (FJSC), the appropriate constitutional body empowered to deal with it. Onnoghen has been charged with failure to declare his assets against him at the Code of Conduct Tribunal (CCT), while Muhammad is accused of making himself available to be used by the executive arm of government contrary to the rules of the NJC. Following an alleged exparte order by the CCT, President Buhari had suspended Onnoghen as CJN and Chairman of the NJC. Buhari, subsequently swore in Justice Muhammad as Acting CJN to pilot the affairs of the Supreme Court in the interim. But the NJC in a swift response held an emergency meeting to properly handle the situation. The council in line with its procedures forwarded the petitions against Onnoghen and Muhammad to them for their responses. Meanwhile, the UN Special Rapporteur on the independence of judges and lawyers, Diego Garcia-Sayán, has warned of an imminent threat to the nation's Judiciary, describing the removal of Justice Onnoghen from office as illegal. "International human rights standards provide that judges may be dismissed only on serious grounds of misconduct or incompetence. Any decision to suspend or remove a judge from office should be fair and should be taken by an independent authority such as a judicial council or a court," he said. 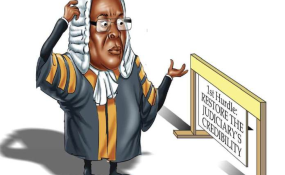 He added that the dismissal of judges without following laid down procedures as stated by law and without effective judicial protection being available to contest the dismissal, is incompatible with the independence of the judiciary. The UN Special Rapporteur noted that Buhari had based the suspension of Onnoghen on the exparte order of the CCT, observing that the order was made in spite of four separate courts orders asking the CCT to stay further proceedings in the trial. Garcia-Sayan, a former judge of the Inter-American Court of Human Rights, said the order upon which the suspension was based, was issued ex-parte while the motion on notice on the same subject was adjourned the day before by the issuing court. He said, "All State institutions must abide by the decisions of national courts and tribunals. In the case of Chief Justice Onnoghen, four national courts hierarchically superior to the Code of Conduct Tribunal had already ordered a stay of proceedings, and the Tribunal had in a previous case, eight months earlier, held that it lacked jurisdiction over cases involving judicial officers, which should be processed by the National Judicial Council". He however expressed worry over alleged reports of threats and intimidation of some of the lawyers representing Onnoghen. "I am seriously concerned at such allegations, which may constitute, if proven, grave attacks to the independence of the judiciary and the free exercise of the legal profession. "One of the senior advocates defending the Chief Justice was arrested on Wednesday by security agencies. Lawyers play an essential role in securing access to justice, and should never suffer, or be threatened with, prosecution or other sanctions for action taken in accordance with recognised professional duties, standards and ethics," he added. The statement noted that the UN expert has expressed his concerns to the Nigerian government and will continue to follow events.